The very word brings a smile to even the stodgiest of swampers. Yes, I made up that word. Spring is positive, it’s bright, it’s pleasing, it’s new hope for an end to slumping wood piles, dirty roads and thread bare back woods. Spring brings work, with gardens to till, border beds to clean, lawns to rake, gutters to…oh screw it, Spring is for fishing. It’s for opening garages full of fishing gear, coolers with seats ready for a two days supply of ice, bails over spools of heavy mono and eight pound braid. The best of partners, Spring creates excuses for fishing, creating excuses for everything else, just as Nature intended. To the sound of red-winged blackbirds, John Barlow gave us, “Broken ground, open and beckoning to the spring, back dirt live again.” Fantastic. Spring arrived the twentieth this month just after the ides of March. Romans recognized March as the beginning of the year with the fifteenth as the ides and while they counted days differently than we do now, the ides corresponded to the lunar cycle and were cause for celebration. The ides didn’t work out so well for Julius Caesar but they’re a perfect excuse to enjoy a fly tying class at the Cross Mills Public Library in Charlestown. No matter your skill level, you’ll appreciate a few weeks of instruction especially since a different fly will be created each week. Equipment is provided but you’re certainly welcome to bring your own vice and materials. Classes began on March 15 and continue for the following two Thursdays. On April 19, you can take your skills on a private fishing day with DEM to try out those new flies. No license is required, fishermen and women at least ten years old are encouraged and quite possibly best of all, there’s no cost for the class. For more information, reach out to Scott Travers at scott.travers@dem.ri.gov or 401-539-0019. You can also learn more about the ARE program at their website, www.dem.ri.gov/programs/fish-wildlife/upcoming-are-events. The ides is also a great day to check out the Whale Guitar Project, which was just featured at the Social Enterprise Greenhouse in Providence. In their own words, “The Whale Guitar is on a mission to inspire action to protect ocean life from deadly fossil fuel extraction and spills, climate change and plastic trash with every audience we reach through each guitarist who plays it! Who will play it next?” So there you go. The event was under the umbrella of Providence Green Drinks, which gathers monthly to promote thoughts and actions for our environment with goals of conservation, while reminding us about a real need to live sustainability. 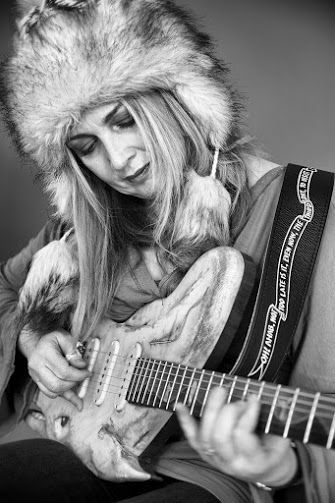 Jen Long is the guitar’s designer and wants to take it anywhere she can to help raise awareness. Considering all Spring affords us, this sounds like a mighty good reason to see this amazing piece of art while introducing yourself to like-minded people who want to keep our environment, which means our oceans, rivers and ponds as well, clean and healthy. On Saturday, April 7, the Narragansett chapter of Trout Unlimited will host their annual Banquet. While typically a much-anticipated members celebration of a year past with cheers and a toast to a new season of fishing and conservation, it’s also the perfect impetus for you to join Trout Unlimited. By signing on before the banquet, you’ll wade right into an organization whose many members are ready to introduce you to how much good this local chapter does. There will be raffles, silent and live auctions for gift certificates, fly rod outfits, wooden nets, jewelry, vintage fly boxes, tools, a generous donation by Jim Less of a custom crafted chest of flies and some always in-demand Al Ball Hexagenia flies. Jeff Perry has donated a guided saltwater fly fishing trip and the folks at Clouds Hill Victorian Museum have donated a tour of their amazing building in East Greenwich. And for those who wish to indulge, there’s a martini basket up for grabs; how can you go wrong with a martini basket? Tickets cost $35.00, which includes a buffet dinner. There’s a cash bar for those who didn’t win the martini basket and the whole deal runs from 3:00 p.m. to 7:00 p.m. on Saturday, April 7 at the Coventry/West Greenwich Elks Lodge in West Greenwich. To join TU or get more information on the banquet, email chapter President Glenn Place at TU225President@gmail.com, or call 401-225-7712. He’s a cool guy too. World Fish Migration Day is April 21. This global event celebrates a theme of connecting fish, rivers and people because sometimes we need to be reminded of how interconnected we are and not just by fiber optic cables and this year’s favorite idols. Reminding us of how much life comes from water, Barlow also gave us, “Morning comes, she follows the path to the river’s shore.” The importance of migratory fishes cannot be understated as so much of the pleasure we receive from the ocean is based on their survival and support of predatory species. Historically, Rhode Island has done a sum zero job of celebrating this important day so if you have a moment, please read through their mission at worldfishmigrationday.com and maybe even visit a neighboring state to celebrate another wonderful rite of Spring.